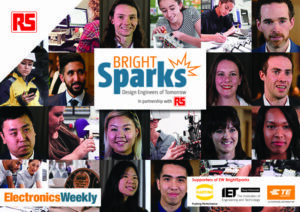 RS Components (RS) is partnering Electronics Weekly for the third year in succession to launch the EW BrightSparks initiative, which aims to find and highlight the brightest and most talented young electronics engineers in the UK today. As in previous years, BrightSparks 2019 is not limited to just one winner but is designed to celebrate a group of young engineers: they could already be making a difference in the first years of their working life, or possibly are still in education but are showing great promise toward becoming the next generation of leaders and innovators in the electronics industry of the future. BrightSparks 2019 is open now to nominees who are based in the UK and are aged between 16 and 30; nominations can be submitted via www.electronicsweekly.com/brightsparks/. The closing date is Friday 15th February 2019; entries will be accepted from the nominee or from a third party. Nominations will be reviewed and shortlisted by a panel of professionals from across the electronics industry, including: Steph McGovern, Journalist and TV Presenter; Lindsley Ruth, CEO Electrocomponents; Clive Couldwell, Chief Editor at Electronics Weekly; David Lakin, Head of Education 5-19 at the Institution of Engineering and Technology (IET); Paul Hide, Director Market Engagement & Membership, techUK; and Graham Curren, CEO Sondrel. Further judges will be announced in the coming weeks and months. The winning entrants will be announced on Wednesday 1st May 2019. This year the programme is being supported once again by the IET, and by leading manufacturers HARTING and TE Connectivity. Previous The October digital issue of Instrumentation Monthly is out now!